At a party in 1920's Manhattan, a group of bored bright young things inadvertently releases a very dark and evil spirit on the city that will wreak havoc on many lives. Evie O'Neill has just arrived from small town Ohio to live with her Uncle Will, the curator of the Museum of Creepy Crawlies, and she's got more on her mind than just having a great time in the Big Apple. She's running away from a secret ability that got her in trouble back home, and she's not the only one in the city haunted by the strange and mysterious. When people start dying at the hand of a shadowy killer bent on completing an ancient and evil ritual, Evie and her uncle get drawn into the investigation. What they don't realize is that something greater than just this one killer has been turned loose, connecting all of the characters in surprising ways. 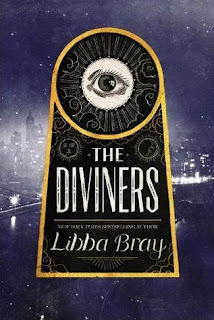 The Diviners is simultaneously creepy and glamorous, a strange combination that wouldn't work for any other writer except for Libba Bray. The jazz and excitement and fun of the Roaring Twenties shine through radiantly and Bray really brings New York City to life, but there is an ominous undertone of evil and darkness throughout the entire novel. Bray's narrative, though focused on Evie and her uncle, is constantly rotating from character to character. Evie is a smart and fun-loving protagonist with guts, and her interactions with stoic and mysterious Jericho and shadowy and sly Sam are a lot of fun. Similarly, her friends Theta and Henry all have some interesting secrets that eventually come to light, and Memphis, who is protective of his family, finds himself in over his head when it comes to the supernatural forces at work around him. There are a handful of many smaller characters who all play into the unfolding drama in surprising ways, and Bray does a very good job at keeping track of the many characters and subplots, The book is busy enough that the six hundred pages fly by, but at times it doesn't seem like the multiple perspectives come together as fluidly as they could. 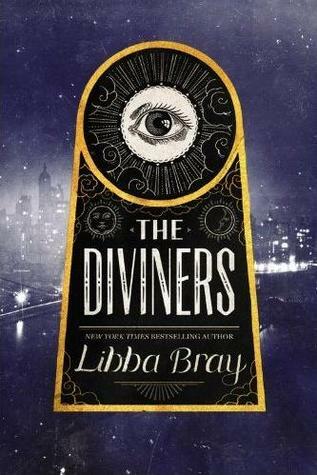 However, The Diviners is completely absorbing and an impressive and spine-tingling read. The ending is also very good—mostly neat and tidy, with a few loose ends that will nag at readers' minds and leave them wondering where Bray will take Evie and the cast of characters in book two. Cover Comments: I like the simplicity of the cover, with the dark city skyline in the background, and the keyhole shape with the eye in the center. It speaks to the ritualistic undertones of the book and is eye-catching without resorting to a bunch of pretty dresses or party scenes, which I think would potentially turn readers off of the book. ARC picked up at the Little, Brown speakeasy. I've been waiting to read this one because I really want to read it but I'm really afraid I'll be disappointed. I should just take the plunge. I really need to start reading more by this author. I've only read her Gemma Doyle books. Libba Bray is really hit and miss with me. I loved Beauty Queens and Gemma Doyle 1 and 2, but 3 and Going Bovine I didn't finish. Glad I liked The Diviners! I think the setting and the general creepiness was something I really could get into. I grabbed a copy of this at BEA.I LOVE the cover of this. I didn't even know it was about the 20's until just recently. I'm excited to hear it has multiple point of views and many subplots and side characters. It's the great side characters that keep me coming back to a great series. I am intimidated by the size of this one though. When looking at the books on my self I have skipped over this twice now because of the size. :( I am glad to hear that it's mostly worth it though.